This Celtic stained glass suncatcher features shamrocks along with knot-work and Ireland. This Celtic stained glass sun catcher features the Irish blessing along with knot-work. Irish pub sign features a shamrock along with a blessing that is hand painted on distressed wood. 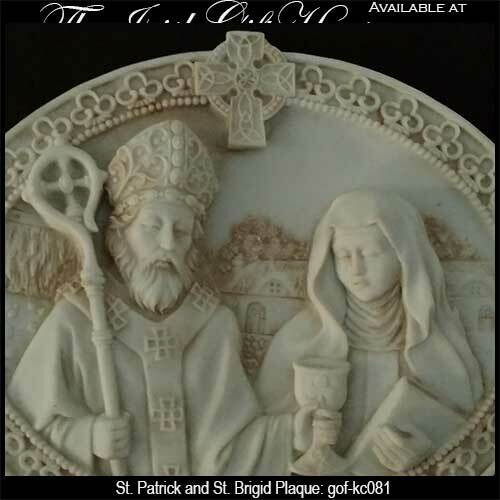 This Irish blessing plaque features both St. Patrick and St. Brigid and it is enhanced with a Celtic cross and a shamrock. 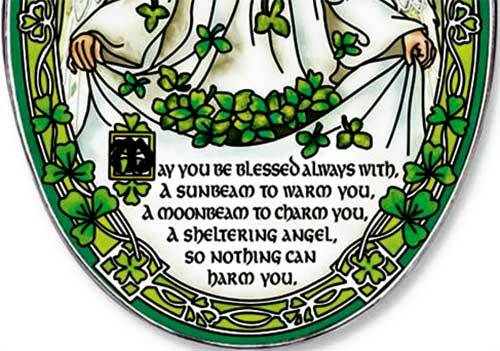 This Irish blessing will server equally well as a stepping stone in your garden or as a plaque on your wall. 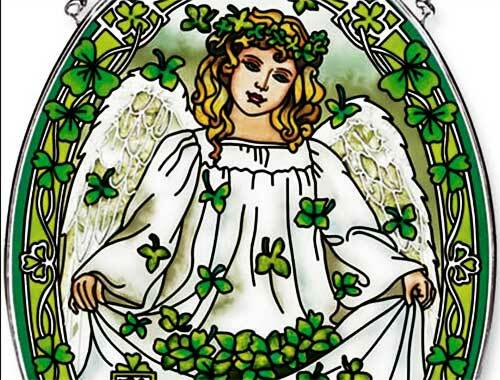 This stained glass Irish sun catcher features a blessing along with shamrocks and Celtic knot-work. 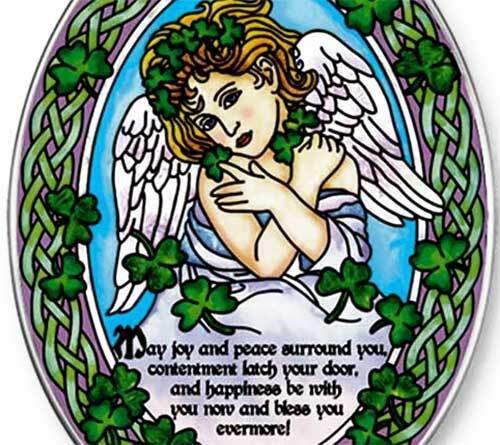 This Irish blessing plaque is in the form of a stained glass wreath with shamrocks. Póg Mo Thóin wall plaque is made of solid brass and would make a great Irish pub sign. Irish pub sign features hand painted words on a distressed wooden plaque. 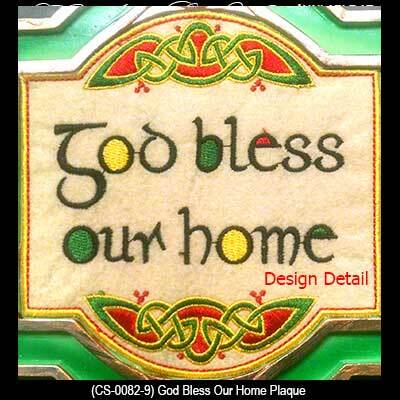 Irish house blessing sign features a distressed hand painted message on a wooden plaque. 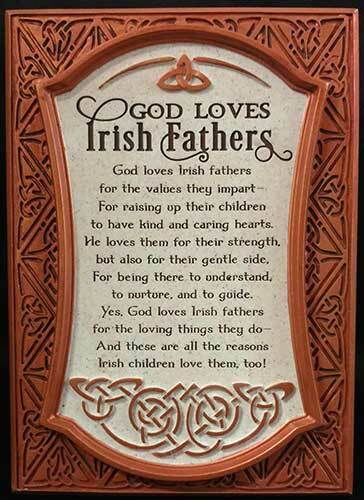 Irish blessing plaque features God Loves Irish Fathers along with Celtic knot-work. 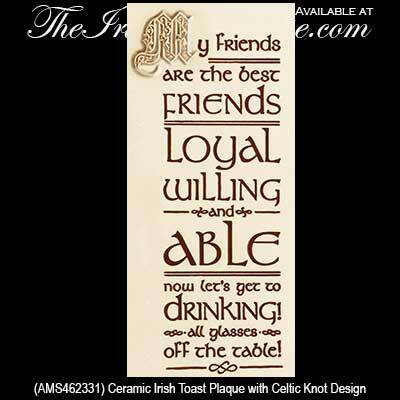 Irish blessing plaque has a drinking toast for friends and it includes Celtic knot-work. 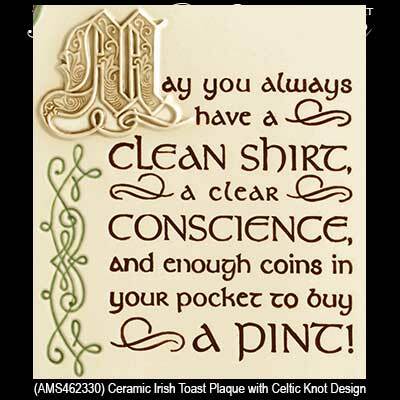 Irish pub sign features an embossed Celtic motif along with an Irish blessing. This framed plaque features an Irish wedding blessing that is accented with Celtic knot-work along with a Celtic cross. 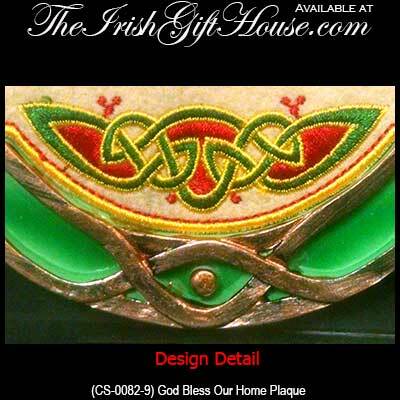 This Irish home plaque features an embroidered blessing along with Celtic knot-work. Irish welcome wall plaque features an embroidered motif that includes the words Céad Mile Fáilte along with Celtic knot-work and a shamrock. Pewter Celtic cross for the wall features the verse to the Irish Blessing. Celtic cross for the wall features the Claddagh and knot-work along with shamrocks and an Irish blessing. This lucky Irish horseshoe wall plaque is solid brass and features the Claddagh. Celtic wall cross features an Irish marriage blessing along with a interwoven love knot in the center. 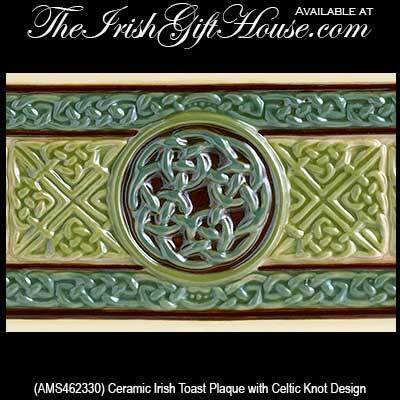 This ceramic Irish blessing plaque features Celtic knots. 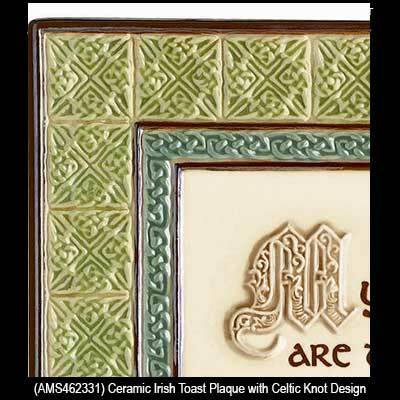 Irish kitchen blessing features a plaque with shamrocks along with a dimensional design with the look of pewter. 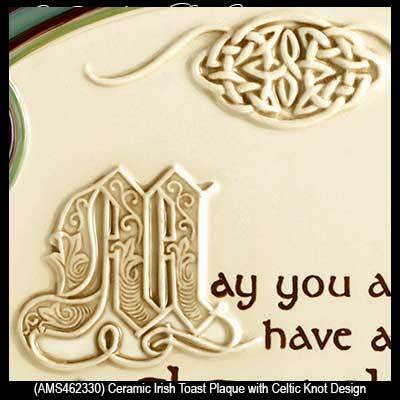 The Bless this Home Irish plaque features Celtic knots is suitable for outdoor use. 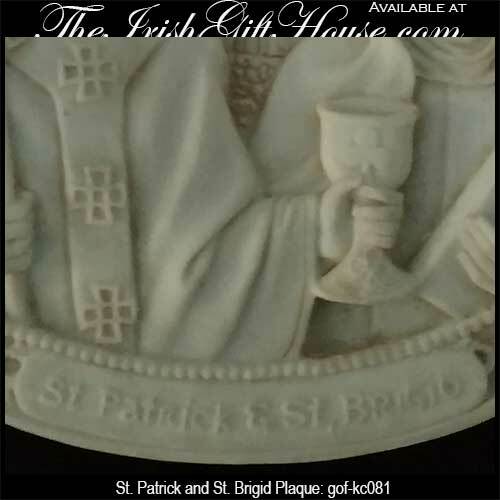 Check out this entire range of gifts that includes Irish blessing plates that will look great in your kitchen. The Irish Gift House also has an assortment of Irish blessing blankets, that will keep you warm on a cold night, along with a selection of Irish blessing wall hangings. 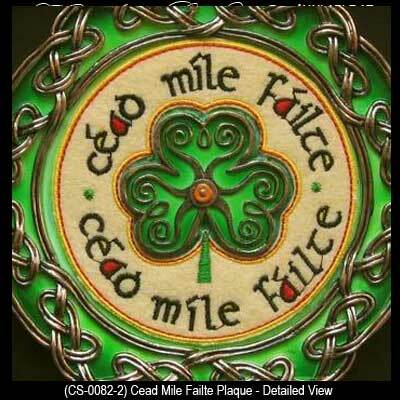 You may also wish to browse our selection of Irish welcome blessings that you will find in our Céad Mile Fáilte Signs section. If you are looking for an Irish blessing shamrocks, we have those too. You will find them made of brass and pewter along with gold plated and copper designs. Within this same section you will also find the very popular Irish blessing clovers that are ideal to hang above your door.